I absolutely love Ilona Andrews. I have pre-ordered exactly three books this year and guess who wrote two of them? Ilona Andrews. When I know that a new Ilona Andrews book is coming out, I actually plan my reading time so that I will be able to finish whatever it is that I am reading the day before the book comes out. I only get two weeks of vacation time each year and I have seriously debated using a day just to stay home and read their books on the release day. So you can imagine how sad it makes me to only give three stars to this book. Three stars is a good rating and I think that this is a good book. It just wasn't knock my socks off good that I have come to expect from this writing pair. I decided to wait for the complete book instead of reading the pieces as they were released on their website. Which by the way...how awesome is it that they do that? At least I think it is pretty awesome. The fact that they are giving their work away to their readers just cements my love for this writing pair. They are just an incredible pair of authors. I loved Clean Sweep and consumed that book in less than a day. I even listened to the audiobook recently as a refresher so that I would be fully prepared for Sweep in Peace (not to mention that I just like the story - a lot). As soon as I had a chance to sit down and read on the release day, I dug right in to the story and noticed a few things that were different. I missed Sean. I missed Sean a lot. The dialog and interaction between Dina and Sean was really the best part of Clean Sweep. Sean's absence in this book really left a hole for me. The fact that no other character in this book was as strong of a character really made a huge difference. I really missed the dialog with Dina. I remember laughing at the things that Sean, Dina, and Arland said to each other in the first book. I didn't find the humor that I was looking for in this one. 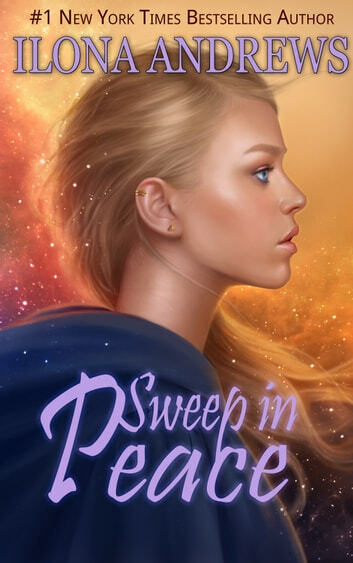 It actually took me several days to finish this book because I was able to put it down which is a new experience for me in regards to an Ilona Andrews book. This book felt really dark to me. Dina was much more serious in this one and it seemed that she was holding everything on her shoulders. I have only read the first book in the Edge series so I am not as familiar with George and Jack as other readers may be. This future for them still makes me a little sad. I didn't like them. All of the sides that are meeting at the peace treaty really seem to have lost a lot and still are finding peace difficult. In so many way, many of the characters were at their limit and many were at their breaking point. I did really enjoy seeing more of what Gertrude Hunt can do. The sky is the limit when it comes to this old inn. I was just amazed at how imaginative some of the features this house displays in this book. I really think that we have only seen the beginning of Gertrude Hunts abilities. As more guests stay at the inn over time, it will be exciting to see what develops as the series continues. I also really liked the new chef, Orro. Orro did add a touch of humor to the story but I think that this is a character that I will like more and more as the series progresses. Caldenia was awesome as always. I would recommend this series to others. Everyone should read Ilona Andrews. I seriously believe that. The writing is solid and the story is unique and interesting. I can't wait to see what is going to happen to Dina next. It's now 4 am and the book is finished. I wish it had been longer, but I have to endure the torture of waiting for the next book. It's been a while since a book caught me this thoroughly, I couldn't stop reading. Dina ends up hosting a volatile arbitration. Three fractions of warriors and merchants needs the arbitrators to help them. Dina becomes emotionally involved with the arbitration. Lies and manipulation layers the whole thing and Dina must take harsh methods into use to solve the problem. This is definitely a book I'll read again. I loved it and I think the pictures of some of the characters is totally awesome. This is a must read book. Andrews has a refreshingly blunt writing style. I continue to be surprised at their ability to deliver large quantities of exposition baldly and directly, somehow managing to maintain engagement all the while. Never once did I feel overloaded with information - instead, the word simply feels accessible and understandable to a degree rarely seen in the fantasy genre. Bravo. Very good book of innkeeper seies! This is 2nd book of innkeeper series and it still delivers a very good storyline with a lot of interesting characters, world-building , reminding me of Lord of the Ring & Star Wars together. I just enjoy the ideas of this series and like the peoples, the bringing in of characters from other series. A strong female is always a plus.